It’s been a week or so now since I ran in the Carnethy 5 hill race just south of Edinburgh. I would have liked to have writen this up sooner, however life is hectic at the moment and baby William comes before everything else. He’s doing well by the way, and is making me realise how much fun life can be with just simple things like a smile, but a few more hours in the day would be really helpful. For those of you who don’t know it, Carnethy 5 is a race which has been going for a few decades now in the Pentland hills to the south of Edinburgh and attracts hill and fell runners from all over the UK to kick off the season. As its name suggests, it takes in the summit of 5 hills, all of which are around the 500m mark. It does this in a shade over 9km, so it isn’t a long race, but it’s certainly a tough one. It was my first ever hill race a year ago, so I was incredibly keen to go back again this year and see how I have improved. It turns out quite a bit, just over 3 minutes in fact, which for a race of this distance and elevation I was ecstatic with. My first PB, although it happens to also be the only race I’ve ever run twice, so it is also my only PB, but let’s not spoil things by getting into the details. As well as a PB though, it was a PB on a day when most people were adding minutes to their time due to the conditions. Now, Scottish hills are notorious for poor weather and even these relatively low lying instances in the Pentlands can see some reasonable amounts of snow. As it turns out, whoever had ordered the weather for race day managed to get a good deal on snow making it a totally different race to the damp and grey conditions I’d experienced the year before. Thankfully, I like running in snow. I have great shoes (inov-8 Mudclaws 235’s) and some warm tops (Ashmei carbon shirt…more about Ashmei later!) and I suspect that, due to continuing my training throughout the winter, I’ve become accustomed to running in most conditions and take things as I find them. The race registration happens in a school hall in Penicuick which is about 3 miles away from the field where the start\finish line is. Consequently everyone gets a coach out to the field from the school. As we approached we could see horizontal snow coming down and even though the start was only 100m back from the road, it was pretty difficult to spot it through the snow, so you knew what it was going to be like. After huddling in a tent for a few minutes, everyone shuffled outside and before long we were off. The start line is one one side of a boggy field with the first climb and last descent on the other side. Once over the bog you reach the first hill, Scald Law, by which time the field is well spread forming a long line of the 600 or so runners stretching up the hill. I remember this sight from last year and it was impressive, but this year, in the snow, it looked amazing and Matthew Curry captured this perfectly with the image below. My climbing is probably the thing which has improved the most in the year and I felt great on the climb up Scald Law. I felt like I had a steady pace and that I wasn’t going to exhaust myself on this first climb like I remember doing last year. The subsequent four, and in particular the last, Carnethy, are all significant hills too. After the big climb up Scald Law, it is a ridge run of sorts across the next three hills, East Kip, West Kip and Black hill. After the last one, there is a long descent down the other side of the ridge to The Howe (no relation), before the final, leg sapping, mind numbing, suicide inducing climb up Carnethy. Once over this, the descent back down towards the boggy field crosses heather covered hills with a few patches of scree. If you like your downhills, you are certain to love this. I did. Heading up Scald Law I found myself behind one of the other runners from the Lomies. He’s usually minutes ahead of me so I assumed he would pull away by the top of the hill. When I passed him on the first descent I was surprised, but he came past me again on the next climb and we did this throughout the race. I found myself pushing harder telling myself to try and keep up with him. Even if he was having a bad day, I would still get a great time as his bad days are typically better than my good days. We summited the last hill pretty much together so i went for it on the downhill. In the snow, it felt easy to go for it, big long stretches of virgin snow making it easy to pick a line and open the legs out. My shoes were gripping well and I felt strong. Sadly, I felt too strong and I was going so fast I found myself feeling like I was losing control and my brain kicked in. Anyone who has ever raced downhill knows that when this happens, the brakes go on and it takes time to persuade yourself to take them off again. Sure enough the guy came tootling past me about three quarters of the way down and we finished about a second apart. I was delighted regardless. I had a great run and loved the conditions. It was one of those races where, even when you are busting yourself to get up a hill, you are grinning like a lunatic because you know this is going to be so memorable once it’s over. My time was 1h 14min 25sec and 182 place. Compared to last years 1h 17min 38sec 274 place, I’ll take that! Before I close something has to be said about the race organisers and volunteers. This is an excellent event and very well organised. 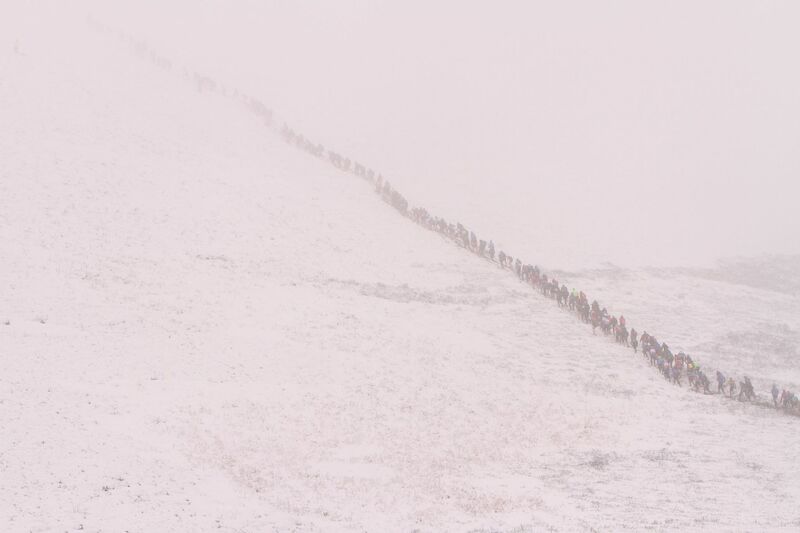 Given the conditions, the army of volunteers that make it possible went above and beyond what anybody could hope for and were cheering us all on the whole race, despite being blown sideways in a blizzard. Thank you. Now back to Ashmei. I learned this weekend that I’ve been shortlisted to be an Ashmei Ambassador. Ashmei, in case you haven’t heard of them, make exceptionally stylish Merino wool running and cycling gear. I love their stuff and applied to be an ambassador for them about a month ago via an ad I saw. I’m on the shortlist and now have to work with them to see if I am to become a fully fledged ambassador. Here’s hoping! #ashmeiambassador. With races like Carnethy 5 on the calendar, runners need great kit so I’m hoping I can work with the guys at Ashmei to help promote their clothing in our community.